George Hooper was a Rome Scholar and then worked for the Recording Britain scheme. In 1945 he joined Sallis Benney, Knight and Cowern on the staff of Brighton College of Art. Less of a traditionalist than they, he taught, and continued to practice, a lively, experimental approach. Born in India in 1910, Hooper was a prolific but generally unheralded artist who received little recognition until late in his life. Although his work sold well during his lifetime, at the time of his death in 1994, there were still over 1500 works in his studio dating from all the key periods of his career. 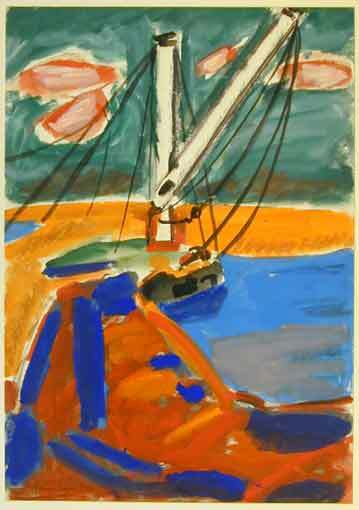 His art captures images from the twentieth century, delighting and shocking his audiences alike with his unceasing inventive and experimental methods - not only by some of the major artistic influences of his time, such as Fauvism and Bloomsbury, but also by his youth in India, his visits to Italy and his time as an air raid warden during the war. Hooper's works include portraits, nudes, still life, British landscapes and drawings from the Second World War. It is a vibrant mix. His colourful creations can be found in the Victoria & Albert Museum, the British Museum and public galleries in Brighton, Hove, Eastbourne and Hull.